I’m Your Vinyl is a great new band based in Dublin,Ireland. 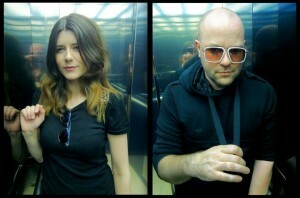 This duo (Dana Donnelly and producer/musician Ken Mc Hugh) are certainly ones to watch. I’m Your Vinyl are an exciting new act from Dublin featuring singer/guitarist Dana Donnelly and producer/musician Ken Mc Hugh (AUTAMATA/WE SAW HEAVEN).Having road tested their songs with a few performances over the past few months, including the IMRO “best of” showcase tour and the Camden Crawl festival, they will release Part one of their debut album on the 15th of June.Part two and three will be released in September and January consecutively. With catchy songs chronicling the joys of life and love, their colorful warm sound is upbeat and melodic with plenty of twists and turns sewn together using uplifting beats and cinematic sonic vistas. Influences range from Bjork and Doris Day to Pulp Fiction and Twin Peaks, IM YOUR VINYL have a fresh new sound that is worth getting to know. This entry was posted in Music Of The Week, News and tagged Music. Bookmark the permalink.